April 2013 – Under Every Leaf. The British Empire and the events that occurred during it have inspired a huge range art and artists. Whether it was capturing and extolling the heroic actions of the British Army (Rorke’s Drift 1879) or putting the most positive spin on disasters (Retreat from Kabul 1842) the artists wanted to show the British public the Empire and the men who defended it in the best light. 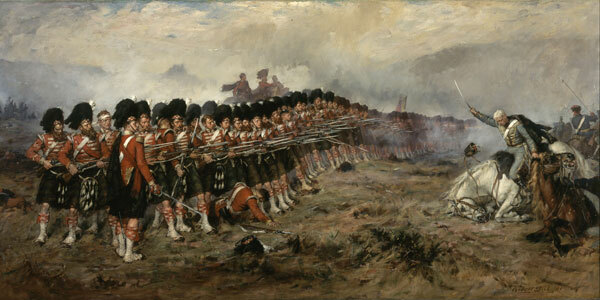 In this post I will show the works of three of the best Victorian battle scene painters. 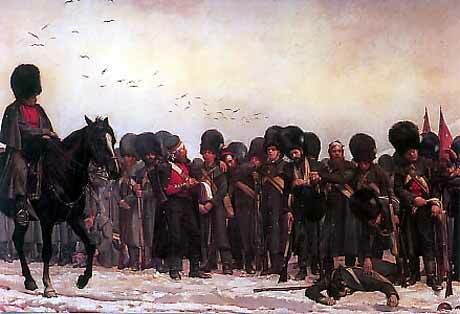 The Roll Call: The men of the 3rd Battalion, Grenadier Guards, after the Battle of Inkerman. The famous picture that won acclaim for Lady Butler at the Royal Academy in London. One of the most famous war artists was Lady Elizabeth Butler. Inspired by a visit to France and the battle scenes by Meissonier and Detallie she started painting battles scenes in 1870. She earned her first commission to the Royal Academy in 1874 and won renown and fame with The Roll Call depicting the Genadier Guards after the battle of Inkerman (1854). As the painting toured Europe she found herself gaining fame because the public found out that she was young and pretty, something not normally associated with battlefield painters. Her painting captured the realism of war, the men were disheveled and exhausted and she always tired to capture the dirt and grime of battle. 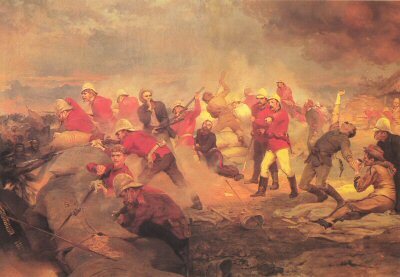 “The Defense of Rorke’s Drift” by Lady Elizabeth Butler Commissioned by Queen Victoria and inspired by survivors’ accounts. A firm favourite of Queen Victoria (who purchased ‘the Roll call’) Lady Butler went on to capture some of the most Iconic chapters of British Military history during the 19th Century. 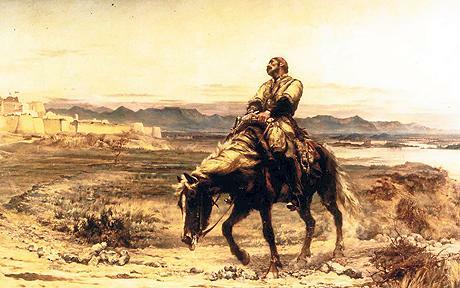 ‘Remnants of an Army’ by Elizabeth Butler portraying William Brydon arriving at the gates of Jalalabad as the only survivor of a 16,500 strong evacuation from Kabul in January 1842. As the wife of a British Army officer she traveled the Empire extensively and came to believe that maybe the Empire wasn’t in the best interests of the natives. This didn’t stop her from painting the soldiers who defended it in the best possible light and she continued painting until her death in 1933. From the Charge of the Royal Scots Greys during Waterloo (1815) to the Retreat from Mons (1915) her painting have gone down in history as some of the best paintings of the British Empire at war. Wollen was born in Leipzig in 1857. Elected to the Royal Academy in 1879, he exhibited every year until 1922. The first picture he exhibited was called ‘Football’ but he soon started painting Military scenes. His first painting was the rescue of Private Andrews by Captain Garnet Wolseley H.M. 90th L.I. at the storming of the Motee Mahail, Lucknow. 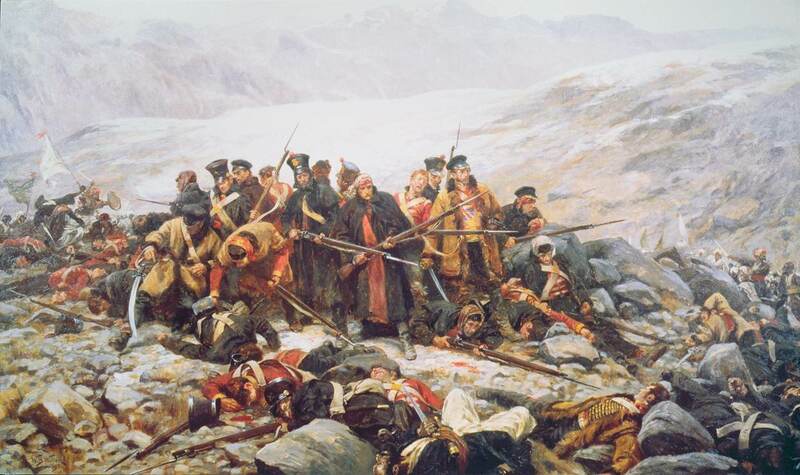 He is best remembered for painting of the last moments of the 44th regiment on their retreat from Kabul. 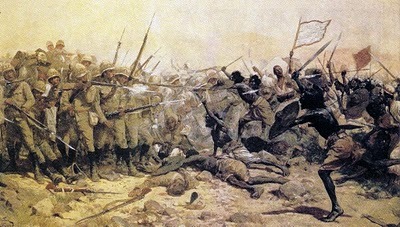 Wollen was employed by an Illustrated newspaper and was in South Africa during the Boer war which inspired a number of paintings. He also exhibited a number of painting both during and after WW1 and continued painting until his death in 1936. While not strictly a battle scene painter, Joy did paint one of the most iconic painting to have come out of the 19th century. 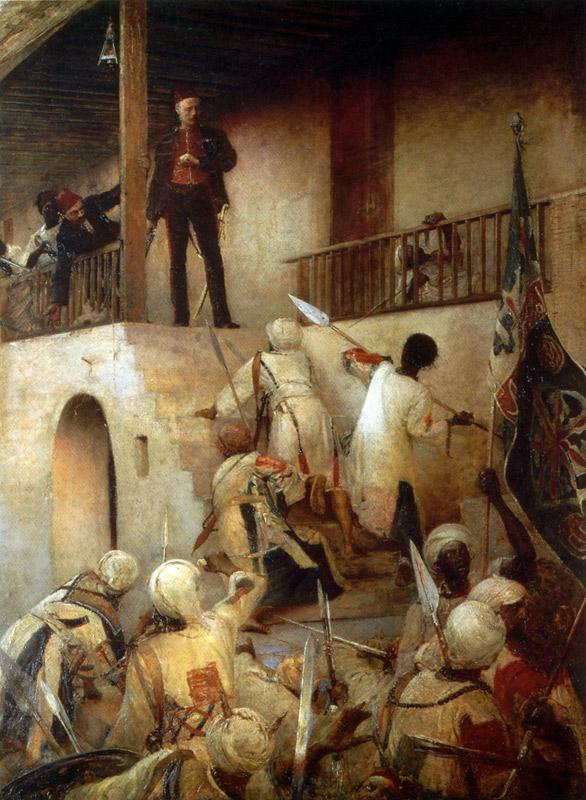 His painting of General Charles Gordon facing the hordes of the Madhi at the fall of Khartoum inspired across Britain a host of Christian evangelists to spread the christian message across the empire. Robert Gibb was a Scottish painter who was a full member of the Royal Scottish Academy who was an accomplished portrait painter as well as painting battle scenes. His most famous work was ‘The thin red line’ which showed the red coated 93rd (Highland) Regiment standing fast against an attack by Russian cavalry during the Battle of Balaclava (1854). Gibb found his inspiration for the painting while reading Alexander Kinglake’s book ‘The Invasion of the Crimea’. Gibb continued to paint throughout the late 19th century and during ww1. 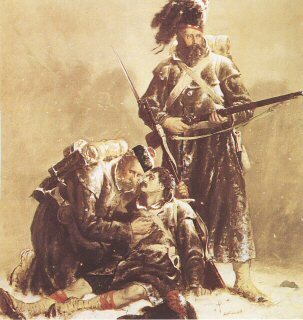 A dying soldier of the Black Watch is supported by his comrade, while another stands to protect them, as the ranks of the Highlanders march on, after the battles at Sebastopol during the Crimean war.